From January through July 2017, when compared to the same period in 2016, the Big Bear real estate market realized a 15.7% increase in total number of residential sales and a 2.3% gain in average sale price. This certainly qualifies as a solid result for the first seven months of the year. However, when adding August and September into the mix, we see that homes sales surged 21.9% from January through September vs 2016 and the change in the average price more than doubled to an overall 5.1% increase. 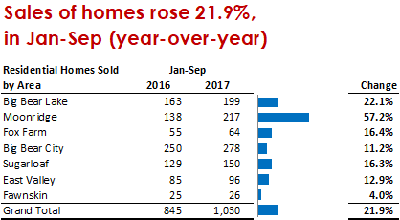 In fact, the 161 closed sales in September 2017 are the most we have seen in any month in over 12 years. Absorption Rate measures the "speed of the market" and the Big Bear Real Estate market is flying into Fall. Demand in the Big Bear real estate market has gained an impressive amount of momentum as we head into the Holiday Season. Multiple offer situations on desirable new listings are much more prevalent now than at any time this year. Buyers were snapping up new inventory at a stunning pace in September and into October. We currently have 408 active residential listings on our Big Bear MLS, down from the peak of 534 in July. There are currently 236 homes in escrow and, based on a typical 45-day closing period, this equates to a scarce 2.6 months of supply. 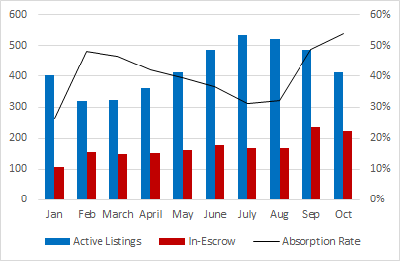 Absorption Rate (# of homes in-escrow / # of active listings) is a simple metric that illustrates demand and the absorption rate is currently an incredible 54% -- meaning over half the active inventory is being "absorbed," ie. purchased, every month. The moral of the story: if you were considering selling your Big Bear property this year, but were feeling that you may have missed the "prime-time" season to list, you didn’t. 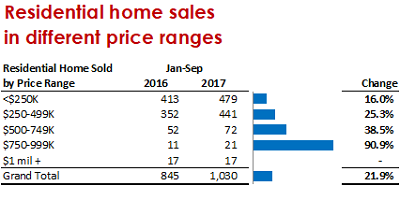 A few more interesting market numbers: The total number of sales (Jan-Sep 2017 vs 2016) as mentioned above, is up 21.9%, but the number of sales in Moonridge is up 57.2% (217 in 2017 vs 138 in 2016). The number of sales in the price range between $750,000 - $999,000 (which has been slow in recent years) is up 91% (21 in 2017 vs 11 in 2016). Furthermore, although the average price in Big bear is up 5.1% Jan-Sep, the average price in Sugarloaf is up 13.5% so far this year. Let us know if you have any questions on the market, on anything you see for sale here, or on your homes current value. We look forward to hearing from you. Until next time: All the best and happy hunting!